Today marks our first week of summer vacation. Let the revelry begin! These photos make me look forward to warm temperatures, bare legs, spontaneous play dates, sun screen, late bedtimes, eating outdoors, and making memories with my girls. This is our "first craft of summer"! Get a piece of poster board and write down all those goals for the next 3 months. I hung ours in the pantry. It's a great idea for keeping track of all those summer activities and it will be helpful on the days when 'boredom' comes knocking on the door. What are you looking forward to this summer? 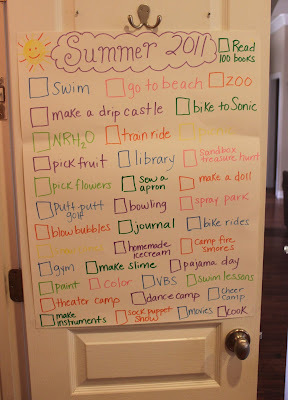 Need some ideas for your list-- check out this link "100 Things to do with Your Kids". Also I am so happy that one of my favorite crafting blogs "The Crafting Chicks" featured my Rapunzel Party on Friday!!! 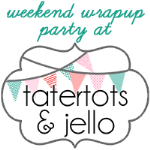 Check out the feature and their super creative blog! I hope you have a wonderful summer! !